Comprehensive package including accommodation for all nights, in-country transport by private bus, train, or flight, lecture and instruction materials from our expert driver guides, all activities, and 2 meals per day. International flights between the expedition and extension is included. *Visa Fees are not included. What better way to experience Asia than to savor its tapestry of tastes, colors, and smells? Learn how to prepare traditional dishes alongside top Thai chefs, and visit the famous floating markets of Bangkok. Visit the Angkor Wat Temple, one of the 7 new wonders of the world, and tour ancient fishing villages. Mingle in the Cambodian market as you select local spices, and take a boat ride through the Mekong Delta Rice Fields of Vietnam as you discover diverse Vietnamese curries. This expedition is specifically designed for travel enthusiasts with an appetite for cooking, culture, and adventure. Arriving in Bangkok, we will take the time to adjust to the time change by having an introductory lesson to Thailand, the history, culture, and the cuisine we will be immersing ourselves in over the course of the next several days. We will settle into Bangkok by visiting the old city, followed by a traditional welcome dinner. Upon arrival at the hotel your hosts will provide you with your dining schedule for your tour, preparing you to have some of the finest culinary experiences of your trip. After breakfast, visit the heart of the city where you will learn about the culture of Thailand through a culinary lens. Enjoy both a traditional market visit and a hands-on cooking experience. In the afternoon we will join at an Original Thai Cooking School for the opportunity to cook authentic Thai food in a traditional setting. Guided by expert chefs, we will take a visit to a local market to learn about the exotic fruits and vegetables and learn about the secret spices and ingredients used in traditional Thai cooking. We will return to the cooking school where our instructors will demonstrate the methods and steps of Thai cookery from ingredient preparation to the actual cooking. We will undertake the task of grounding pastes, chopping up meats and vegetables, stir-frying, deep-frying, and creating the most delicious Thai dishes. We will finish our day with free time in the heart of the city to enjoy shopping and dinner. Today, visit a few of Bangkok’s many temples. Visit the beautiful Wat Pho and see the famous reclining Buddha. As you reach the right side of the river, visit the Wat Arun, the magnificent “Temple of the Dawn”. After lunch, embark on a bike (or tuk-tuk) ride through the countryside, experiencing rural village life and meeting locals along your path. Additionally, visit markets such as Or Tor Kor and Namg Leong Market, floating markets that are home to stall after stall of colorful fruits and exotic produce, and one of the best places to try traditional food such as stir-fry noodles and mango sticky rice. Bangkok is full of many neighborhoods, each with a unique approach to cuisine. From street stalls to local eateries and fine dining restaurants, take in culture and tradition with every bite. Learn the history of various recipes, why particular ingredients are used and savor a variety of new and mouth-watering flavors. This morning we will set off early via flight from Bangkok to Siem Reap Cambodia. When we arrive we will be met by our driver and guide and chauffeured to our boutique hotel. As we drive we will pass by beautiful jungle, rural villages, and farmlands during which our guide will give us an introduction to Cambodian culture, history, and cuisine. Check-in to our hotel and enjoy a peaceful afternoon. Take a leisurely walk along the Siem Reap river and enjoy the exotic nature of the Old Markets and the beauty of the surrounding land. In the evening dine on traditional Khmer cuisine during your welcome dinner and dancing show. Spend the night in one of Cambodia’s best boutique hotels. Today we discover the mysteries of Angkor on a full-day, small-group temples tour where we will spend our day exploring the iconic Angkor Wat, see the enigmatic faces of Bayon Temple, and wander around Ta Prohm where the trees are intertwined among the ruins. In the afternoon, we will continue your exploration of the temples with a visit to the Bayon, the Ta Prohm, and Angkor Archaeological Park for a climb to the top of Pre Rup, a mountain temple, to talk with monks and catch the view of the sunset over the reflecting pools and the Phnom Kulen and Phnom Bok hills. After a full-day out in the ruins, return back to the hotel for the evening. After a delicious breakfast and morning at leisure, you will embark on a traditional market visit and Khmer cooking course. Learn to make traditional dishes such as Fish Amok, Banana Leaf Salad, and Khmer Noodles. After your cooking class, sit back and enjoy a delicious lunch of the dishes you helped prepare. Visit a local family, and learn about the herbs and vegetables grown at most Khmer households and used in daily cooking. Our visit to each family’s home is an opportunity to learn about food preparation in a Khmer home and see how the traditional shopping and cooking is done. We will learn about the typically ingredients used in Cambodian cooking and have the opportunity to create our own delicious Cambodian meal. After breakfast, pack your bags, checkout, and arrive promptly at the designated lobby meeting place for your morning departure to the Siem Reap International Airport with your driver, in time to catch your flight to Vietnam! After having incredible experiences in both Thailand and Cambodia, we will continue our journey onwards with a flight to Ho Chi Minh, Vietnam. Say hello to the heart of the Mekong Delta. When we arrive in the Ho Chi Minh City, we will check into our hotel and then proceed to orient ourselves with the city, visiting the markets, trying new foods, and spending free time in the parks watching the traditional Tai Chi and martial arts dancers practice. We will end our evening with the famous Night Market Food Tour in the Central Market and an authentic Vietnamese dinner. Today we will set out for the Mekong Delta, one of Vietnam’s two main rice bowls. On this journey, pass through lands comprised of low-lying rice paddies and rivers that are bordered by dense mangroves and palms. 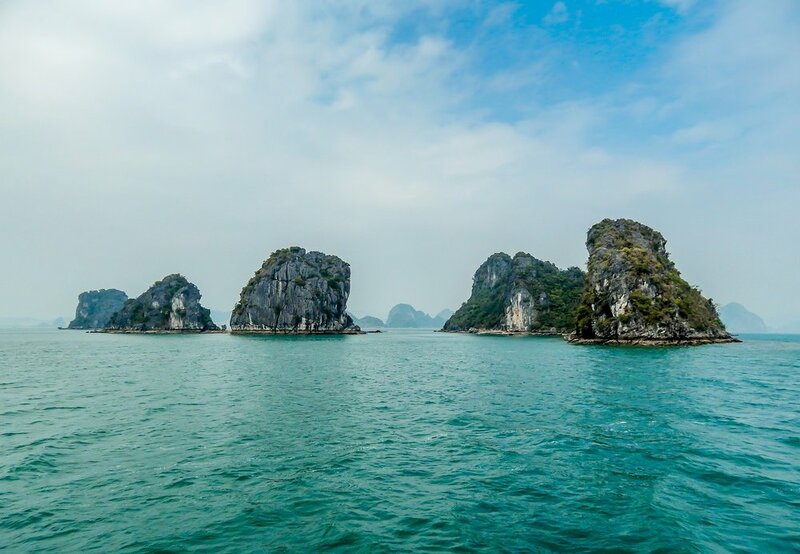 Boarding a longtail boat, we'll pass through the Mekong Delta and Ben Tre to explore fishing villages and the four islands of Dragon, Unicorn, Turtle and Phoenix. As we cruise along Vam, Xep, a small canal dotted with little village houses, glimpse the daily life of local villagers and join them for a traditional lunch. During the ride, our guide will explain the agriculture of the region and how it's incorporated into the local Vietnamese cuisine. Spend the afternoon with a local family in the Mekong Delta, learning about their culture and lifestyle. Here we will be exposed to how Vietnamese live every day, and have the opportunity to sit down to enjoy a delicious lunch with the local family. As we sit with them to dine on delicious homemade beef soups, noodle dishes and rice platters, we'll come to understand the importance of food in their daily lives. This is guaranteed to be one of the most unforgettable and enriching experiences of our trip. Drive back to Ho Chi Minh in the evening, enjoy dinner, and overnight at the hotel. One of the healthiest cuisines in the world, food in Vietnam is often also used as medicine. During your hands-on cooking classes held in a beautiful part of Saigon, you'll experience a Vietnamese Markets & Gardens with varied herbs, spices and vegetables. After learning about the what it's like to be a Vietnamese farmer, select herbs and vegetables to prepare delicious, healthy Vietnamese dishes such as Pho, Bahn Mi and summer rolls. After your instruction, you will enjoy lunch with the chef. After a delicious breakfast, we will check out of our hotel & continue to the airport to catch our international flights back home. Oops! We are still working on this page. Please contact us if you have any questions.